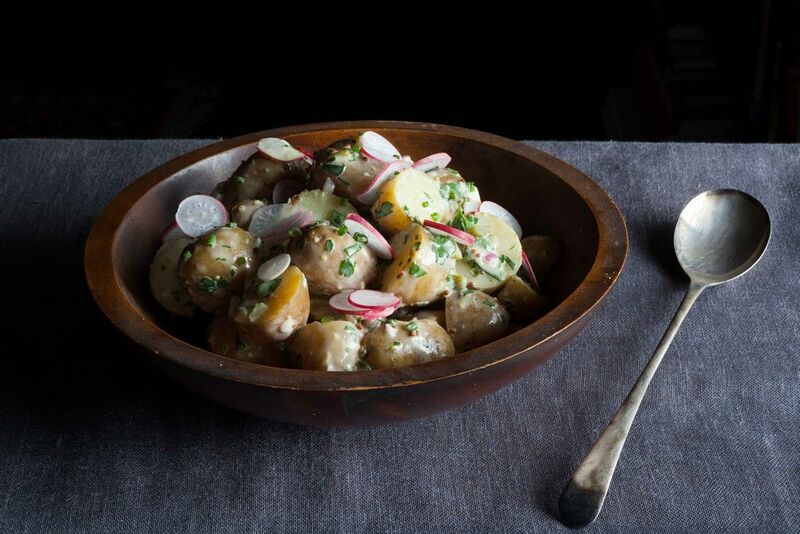 Today: Managing Editor Kenzi Wilbur explains why she has a genetic affection for potato salad, and why you should make her mother’s version as soon as you can. The food of my childhood was sturdy, full of stews and cozy mashes. And casseroles: pea, ham, tuna -- usually separate, but you never knew. In the winter, these played flank to hats and scarves, because we needed meals that would help us stand up to the cold. When warmer weather came, we did not eat delicate fiddlehead ferns or morels on toast. We probably had ramps, but only because they sprouted of their own free will by the river out back. We might have trampled them while looking for tadpoles. When our mother called, we came running for grilled chicken and potato salad. If this all sounds like some kind of radiant country dream, that’s because it was: When I went to sleep each night, I did so to the sounds of a brook slowly folding over smooth rocks and an unrehearsed choir of crickets. It was downright poetic, sunny like a song in a musical, the verses of which write themselves. During the days, my brother and I would scour the river for crayfish and bullfrogs; we’d swim; we’d run the length of the field behind our house. In the summer, we needed meals that would give us the energy to romp all day. We needed that potato salad. My mother delivered. 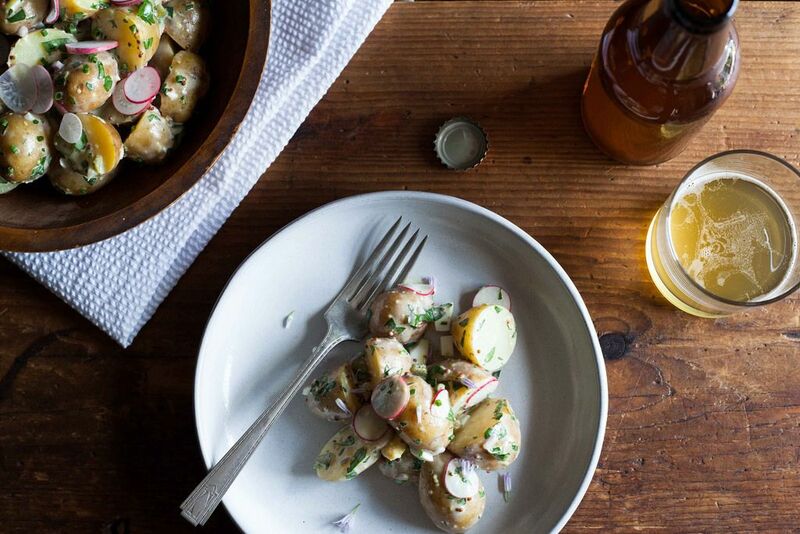 She makes one hell of a straight-shooting potato salad, one that makes no promises of lightness. It’s brash in all the right places, and this might annoy you at first. (“Where’s the subtlety?” you’ll wonder. 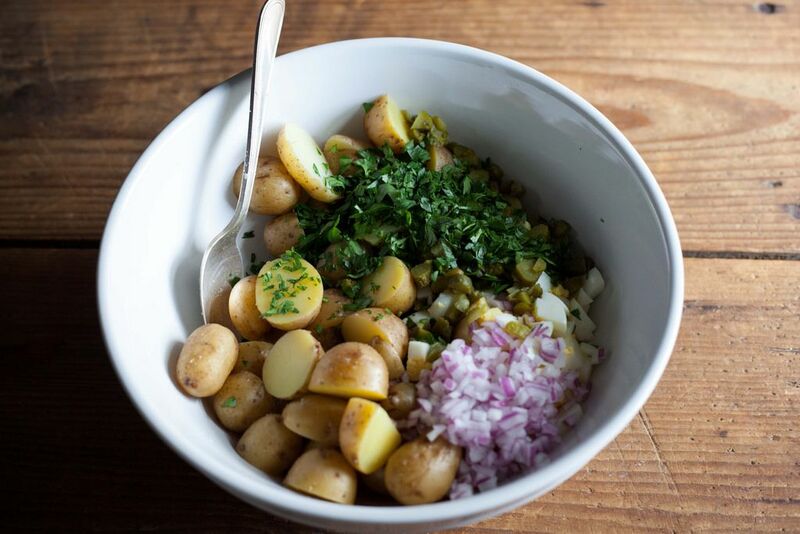 “Why won’t this potato salad let me form my own conclusions?”) Your instinct will be to make a more passive pasta salad instead, but then you’ll give it another chance, and you’ll understand. In this way, it’s a lot like my mother. I asked her for her recipe recently, and because I’m her daughter, I subbed and swapped and tweaked (to do this to a mother’s idea is just short of genetic obligation), but it’s still her salad, in essence. It's burly and rich from olive oil and mayonnaise (make your own if you’re inclined, but it’s not necessary); brisk from pickles; heady from tarragon. If you forgo the hard boiled egg you don’t know up from down. Well chilled and left to meld, it bears a lot of flavor resemblance to Sauce Gribiche, which is likely why it tugs my heartstrings quite so much. It’s my mother’s birthday soon, and I think I’ll make this for her, my way. You’d be smart to make it for the Fourth, and every week thereafter, until the temperatures drop and the sun shines shorter. Always make extra -- you’ll want the leftovers -- and then spend the rest of the day outside. I love this beautifully written story. The recipe, too. Thanks Katherin for my birthday wishes which are being used TODAY!!!! I'm loving every bit of this. At first I read this as "bite" and it made me very happy. This makes me want to go hug my mom, and then make some potato salad, and eat it in a field. This is beautiful. "Why won't this potato salad let me form my own conclusions?" love it, love the recipe! Thank you creamtea! Please let me know how you like it. "If you forgo the hard boiled egg you don’t know up from down" -- that line is perfect! 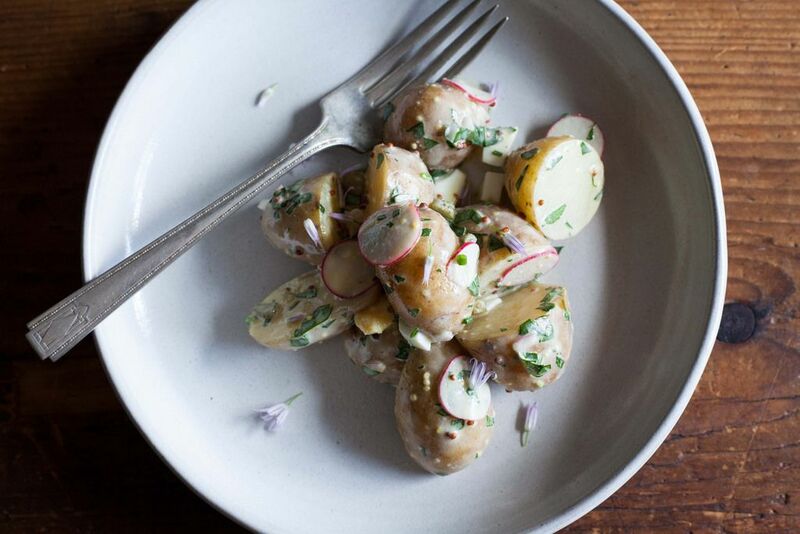 I don't know if the radishes, tarragon and chives are your touches or your mom's -- but those details are putting this salad near the top of my summer to-cook list. :) The origin of the radishes is fuzzy, but I know for sure that the tarragon is all my mom. I never use fuzzy radishes...Haha...the origin stems from trying to perk up the over all blandness of the salads appearance. Once the dressing met up with the radishes it really worked (as long as they are very thinly sliced)!! And this piece Kenzi is now in my Food52 collections instead of in my head...thank you for such a nice birthday present!! "In this way, it’s a lot like my mother." HOO!